Note: Double bottoms, 3 water tight bulkheads, electric lights; first 300' freighter on Lakes. Mutual Transit Co, Rockport, OH. 24, 38 & 61 x 42", Globe Iron Works, 1200hp at 78rpm or 120 lbs steam. Lakes' first triple-expansion engine. 12 x 141 scotch boiler, 150 pounds, Globe Iron works. Boilers: scotch 12d x 141 pressure 150 by Globe Iron Works. 6 - 9 miles off Sturgeon Bay. Insurance fraud suspected, never proven. 1887 Feb 2 Launched, $130,000. 1887 Jun 1 Enroll Cleveland, OH. 1888, Jun 12 Bound Escanaba - Ashtabula, ran aground on 11' shoal, 2 miles southwest Peninsula Point Light, Lake Michigan. 1889, Sep 17 Returned to Cleveland from Astabula after 36 cargoes aggregating nearly 90,000 gross tons ore & record of close to 40,000 miles. 1899, Jul 27 Owned National Steel Co.
1901, Jun 3 Owned Pittsburgh Steamship Co, W. Virginia; in ore & coal trade. 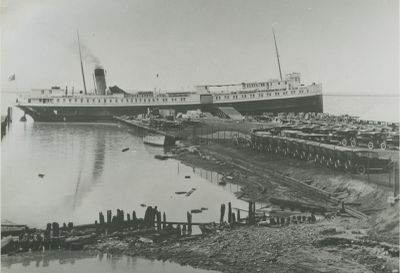 1910, Jan 7 Reported owned Port Huron & Duluth Steamship Co. to be converted to package freighter. 1910 Rebuilt as passenger freighter at Milwaukee, WI; 2425 gross / 1813 net tons. 1910, Apr 21 Towed Milwaukee - Cleveland, OH to have cabin work finished at Globe yards. 1910, May 24 Renamed LAKELAND. 1910, Sep 20 Beached after collision with barge JOHN SMEATON, Little Rapids Cut, St.Mary's River. 1915 Running Duluth - Port Huron. 1917, Mar 8 Owned Northwestern Steamship Co., Port Huron. 1919, Jun 28 Owned Frank J Peterson, Cleveland, OH & George A. Collinge, Conneaut, OH. 1920, Jan 19 Owned Tri-State Steamship Co., Lake County, OH. 1924, Dec 11 Documents surrendered; lost / foundered, no lives lost.